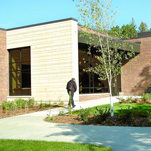 The newly constructed Liberal Arts Building (LAB) at Itasca Community College provides technology-rich classrooms, a computer lab, faculty & staff offices, conference rooms, and student lounges. Located in the north woods of Grand Rapids, the college desired a building that fit within its context and had sustainable features met both their goals as well as those of the B3 Guidelines. The team reported that following the Indoor Environmental Quality guidelines enabled students and faculty to benefit from increased comfort, well-being, health, and productivity. One sustainability strategy that impacted the indoor environmental quality was the use of salvaged structural timber elements from the building previously on this site. These materials were re-purposed into the design of the ceiling and accent walls. Results from their post-occupancy survey revealed that students felt that both the overall facility and their primary classroom enhance their learning experience and health. On average, the students were satisfied with every surveyed aspect of their classroom environment, especially the indoor air quality, cleaning and maintenance, acoustic quality, and electric lighting. This project is the winner of the 2016 Best of B3 Indoor Environmental Quality - Classrooms Award.